ArchLabs 4 is here at last. Brett, Erik, Hari and I (Matt) are super excited to present ArchLabs +4. We released a test release (ArchLabs 3.4.0) back on the 7th of April to show off what we had achieved since +3 and so far we have received such positive feedback. It’s really an uplifting feeling to be so widely appreciated. Since then we have been working hard on bringing the next release to the Linux community. As today is the one year anniversary of BunsenLabs first release we thought that it would be a fitting tribute to release +4. Happy 1st Birthday BunsenLabs. We have kept the default look that we all love from BunsenLabs but have added a fair few new themes and icon themes as well as our own repository. The polishing and fine tuning has been a priority and will continue to be. 107 commits were made over the last few months and that was just the tip of the iceberg. There have been a number of extra keybinds added (check out the Display Keybinds in the menu to see them all), the tiling keybinds are especially cool. Papirus, Sardi, Moka, Faba and Numix-Circle Icons have been added to the list of icon themes. A few nice touches to compton have been added, there are some nice slight transparencies happening. All terminals have now an awesome cool design. Termite being the standard. Adding terminator. Erik’s epic Arc Theme Colora script has been unleashed on the Arc themes to create 9 new custom themes. Also the menu has been tidied up and obmenu-generator has been added for those of you who want to add icons etc to your menu. 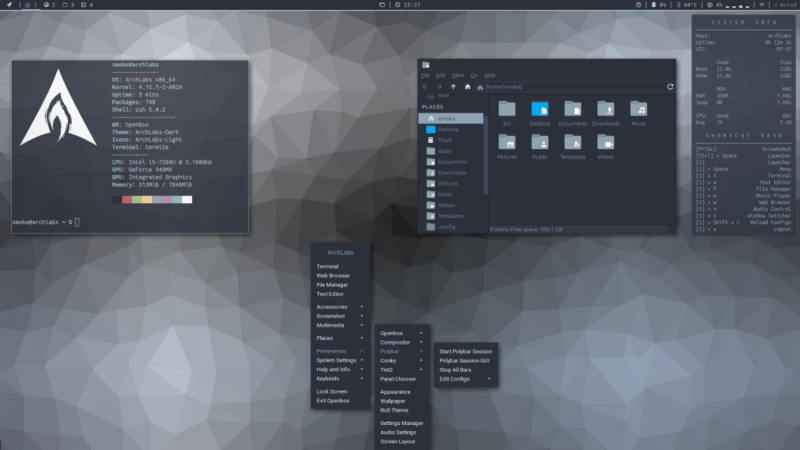 All the conky configs have been updated to the latest syntax by Hari, and we have added some more logo’s for you to use. You can use plank as extra menu and have many great themes with it. We have added a folder scripts to your openbox folder for your convenience. Getting the latest kernel, removing virtualbox applications if on SSD and changing hard-coded icons. One major difference to BL (other than the Arch base of course) is that we have done away with al-exit in preference of oblogout. This is a personal preference of the AL boys over al-exit. Be advised : We are still having a long boot time for the live session only and for the first boot after install. Also opening anything as root for the first time has a bit of an extended wait but any following instances are instant. 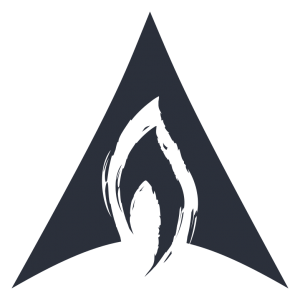 Once you have opened a root instance and had a reboot everything is like greased lightning. .
~We hope to implement ArchLabs as a rolling release distribution. The webpage has a gallery section added. Here we will update with our favourite customized ArchLabs screenshots to show off what can be achieved with Openbox, we suggest you have a spare pair of underpants handy. We had a bit of a team change in the last few weeks with the departure of Rajat. We are grateful for his input and wish him luck. Our friend Jody has asked to be removed as an “official” team member, but since he was so vital to the beginning and creation of ArchLabs we have left him at the webpage as a tribute to his positive attitude and his ultra helpful attitude. It means a lot when another Dev can put aside development on their own work to help. Any issues, contact either Brett, Erik or Matt (myself) rather than Jody as he is insanely busy with his own distribution, OBrevenge. So at the moment it is just the three four Musketeers: Brett, Erik, Hari and myself (Matt). ArchLabs is a work in progress. Help us make it better by getting in touch with us, all feedback is welcome, good or bad. If you feel you can contribute and would like to join the team, contact us either via the webpage, Google+ or at the forum. 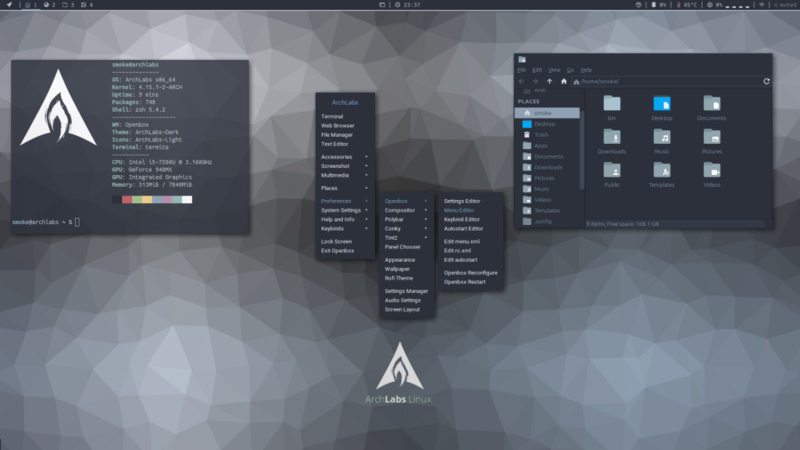 As always thank you to BunsenLabs for creating the distro that inspired ArchLabs. Thanks for checking out AL+4 and we hope you love it as much as we do. The dream os!!! Everything is what I want. I will install it right now!!! I’m a docker addict, using macbook pro under linux. Good luck to me. Good luck, let us know if you need help. I change to gnome based archlinux. It’s not archlinux’s fault, it’s xfce and openbox’s problem. HiDPI is not well supported by them, although I can hack something, but it’s not perfect. 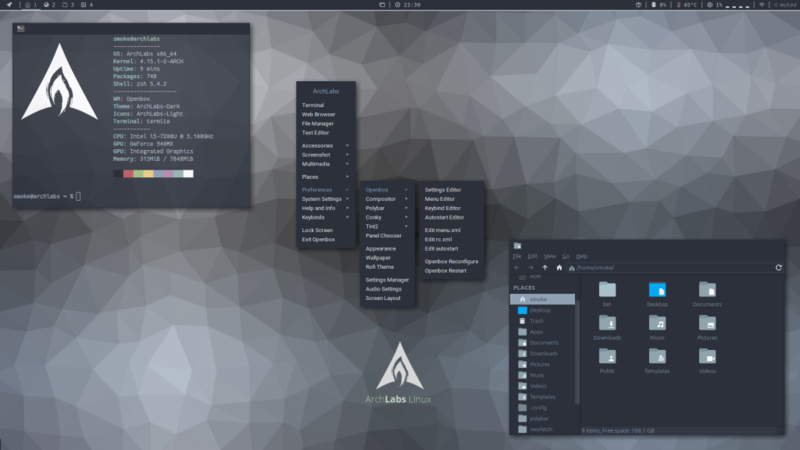 But archlinux is beautiful, and I learned something from it. I hope you can take HiDPI seriously. Of course, I was prepared to face it. But for non-aware EFI users, it can be a huge catastrophe ! !